Hi everyone. 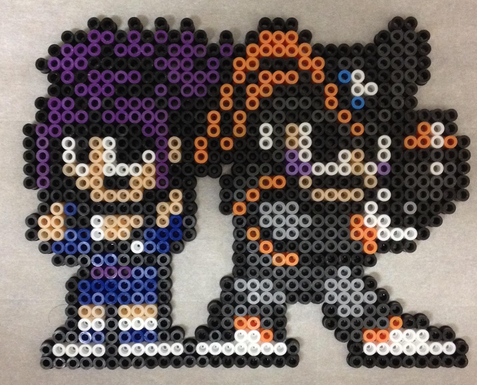 Recently while rummaging through my storage unit, I came across half of my Perler beads that I had been missing since we moved over a year ago. With that, and since in that time a lot of sprites have changed shape and design since I initially did some of these, I wanted to start off with something strong. I chose, of course, my favorite RPG character: Disco! :ZeroDXZ, sir, there's something awesome up ahead, what do i do!? :*takes off helmet* Ice-Man,... THROW THE LIIIKKKEESS!! These are fantastic! OMG Disco!!! Wow, ever since I made my sprite showcase thing, everyone else is making awesome art showcases. @ZeroDXZ : The Like Button. Like Man's weapon, weakness of Dislike Man. Updating with some I've had hanging up for a few years now. @Rhythm_BCA : Man, that group shot though. How did you do it? Do you normally make each robot separately then put them together and work out the kinks? Or do you like just envisioning it in your head? I've tried some spriting myself, but some people just have that talent! 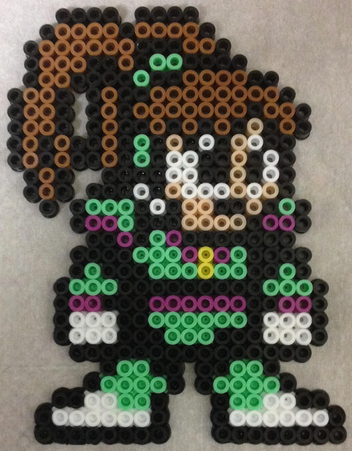 Seriously, I can barely believe that you made this out of BEADS. what I normally do is sprite it out on the computer first, then once it looks good enough, i just use the image on the screen as a guide to put the beads. that's the best way to do it. with the beads first, if there's any mistake you need to redo almost everything! it's best to get it right on the easier paint program than with the beads. Another update with another random character. For those that don't read the Archie comics (not sure why you wouldn't, go do it, it's awesome), this is Tempo in her armored form, known as Quake Woman. I'm very reluctant about sharing this sprite version of her since there are multiple versions of her floating around on the interwebs (and most of them are over-designed 8bit and don't look good) so i'm wary of showing my version of her. Let's just say that sprite theft occurs too often in the spriting circles. In any case, here she is. @Rhythm_BCA : Like how you had mentioned with the over-complication, I like the simplicity and accuracy in this sprite. It looks like it could actually be in a game, unlike some other ones. @Rhythm_BCA : I actually don't read the comics because I have no way of buying any. @Rhythm_BCA : Well, where do YOU look? I kinda want to see that Mega Man-Sonic Crossover stuff. I think there might be too many colors, actually. She'd probably need to be on Super Nintendo to be accurate. @Reisrat : well, short answer is "Plant Man Logic" but we can get into depth with that. Ah, okay. That seems pretty roundabout, but eh. Thanks for the explanation on how it might have worked on NES, I didn't know about the two-layer thing, let alone Plant Man having a third one.